What is your role in Searching for Sebald? : I am a new member of The Deconstructive Theatre Project, acting as the designer for analog film components in Searching for Sebald. Tell us a little about The Deconstructive Theatre Project? : My first experience with The Deconstructive Theatre Project was doing video documentation of their premiere run of The Orpheus Variations at the Magic Futurebox in Sunset Park, Brooklyn. Filming theatre is a common experience for an NYC videographer, and it's usually a one-night job. I was used to setting up the camera in the back and filming the proscenium as it was presented to me. But before filming for The Orpheus Variations, I was prompted to come two nights lest I miss any of the action. I knew there would be many components to the piece, but it wasn't until the night began I realized the task I had before me as a documentarian. DTP makes theatre happen right in front of you. As an audience member, you're asked to participate in the making of the piece with active eyes, ears, and a more active mind. In addition to the physical performance by the ensemble, DTP shows utilize live filmmaking, live Foley, props, movable sets, and dynamic lighting. I definitely needed those two nights to film the show because so much happened simultaneously that I had trouble keeping up with my camera! How is the creation process going so far? : In the workshop process, the ensemble is in the midst of devising a series of sequences that incorporate all the elements of DTP's vocabulary, but new forSearching for Sebald is the use of 16mm and Super-8mm film footage shot along the coast of Suffolk during a trip Director Adam Thompson and Associate Director Meghan Kennedy took in November 2013. What is the developmental process like for you as an artist? : As a filmmaker using analog film in my personal work, I'm eager to share the magic (and the frustration!) 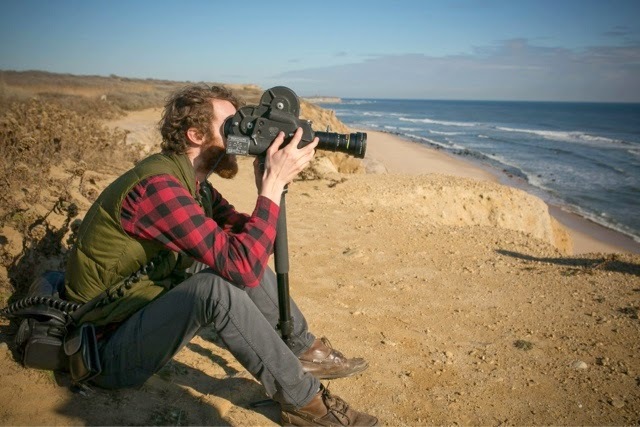 of using a linear and tactile moving image like analog film. The medium comes with its limitations, but I find in my own work, and my teaching of the format, that it breeds a different type of creativity when you have to think within its bounds. I see that happening with the ensemble as they see the footage for the first time, then work with it using their hands to shape it into their devised sequences. What is it like working with mixed media? What are some challenges, benefits, risks etc.? : The challenges of working with mixed media are often technical and require time and tinkering to find solutions. The risks you take while working on analog film are jammed projectors and broken splices. But the benefits are the spectacular moments when the multimedia interact in a way they haven't before. We're working on combining digital projection with analog projection, and sometimes the happy accidents become the solutions and lead you in a new direction. Tell us a little about W.G. Sebald and “The Rings of Saturn”: The Rings of Saturn is a very visual book in both its descriptive language and simply the fact that Sebald intersperses the text with photographs. You may be reading a passage about one location he's visiting, and then a few pages later see a black and white photograph of what may or may not be that location. In this way, the experience of reading the book reminded me of my experience seeing the cine-essay San Soleil for the first time. Directed by the unclassifiable French filmmaker, journalist, essayist Chris Marker, San Soleil is a meandering meditation on human memory and much like The Rings of Saturn, the audience is at the mercy of an unpredictable narrator. The two texts, so to speak, can be re-watched and re-read multiples times, and upon each experience, more is drawn. How does W.G. Sebald and “The Rings of Saturn” inspire you as artist? : Having not heard of Sebald's work upon the first reading of The Rings of Saturn, and having not read his other work yet, Sebald's free association style inspires me as an artist to draw on all my resources, influences, and dreams to create work that also has the liberty to wander. I think I'll keep my experience of reading The Rings of Saturn with me even after work on Searching for Sebald is completed. What is the importance/relationship of memory and the wandering mind to you as an artist? : I think I'll quote Albert Einstein here and say, "The most beautiful experience we can have is the mysterious. It is the fundamental emotion which stands at the cradle of true art and true science. Whoever does not know it can no longer wonder, no longer marvel, is as good as dead, and his eyes are dimmed." teaching us about who we are as human beings. There's no better way to explore that than by using our creativity to build something for others to plug into as well. Why Searching for Sebald now? : Coming off the successful vocabulary devised during the The Orpheus Variations, DTP is looking to take it to the next level with Searching for Sebald, so now's the time to keep the momentum building. What can we expect to see inSearching for Sebald? 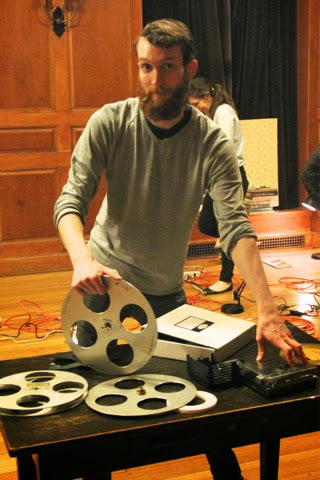 : In Searching for Sebald, one will see members of the ensemble operating 16mm and Super-8mm projectors in juxtaposition with digital imagery, live Foley, narration, and theatrical lighting to create a multimedia tapestry that evolves and grows through the performance. Everything will be happening all at once, all together, and it will be a dynamic experience for the audience.